OK OK so my OCD got to me...despite the Phillips LEDs being significantly brighter as well as instantaneous in lighting up, their design - with those wide fins - results in dark vertical shadows that of course bother me. So, it was back to searching Rakuten for alternatives. Unfortunately, I could not find another well known brand name manufacturer that sold an LED of the right size and spec, and equal or greater brightness. 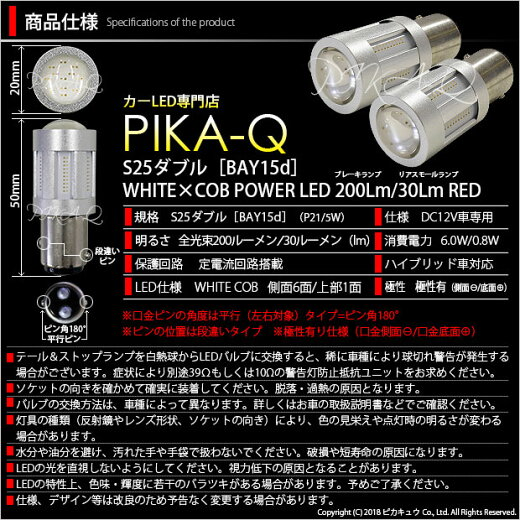 I did, however, find an online store called "Pika-Q" that specializes in automotive LEDs. Despite the silly name, not only did they have an S25/1157 (P21/5W) product claiming 200 lumens of brightness, they offer an 18 month warranty as well. Just in case someone at Nissan asks me for LED advice, I got these which fit the NV200 Nissan van. 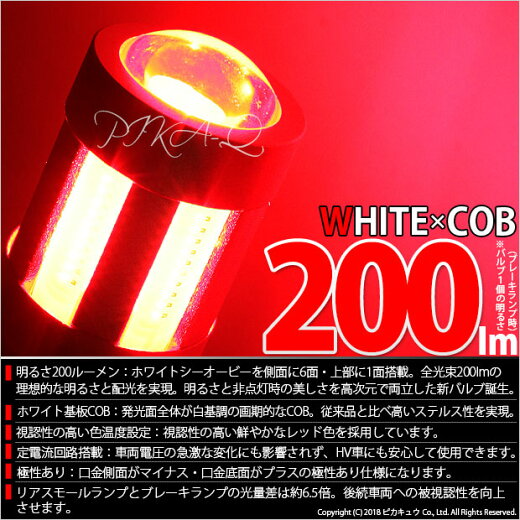 As the design shows, not only are these fin-less, but also shoot a red beam directly backwards through a lens, using Chip on Board (COB) format, with the underlying circuit board white colored (thus Pika-Q calls them "White COB"). 200 lumens when braking, 30 lumens tail light. Power consumption of 6.0W and 0.8W respectively. So I went ahead and ordered one pair to test out. 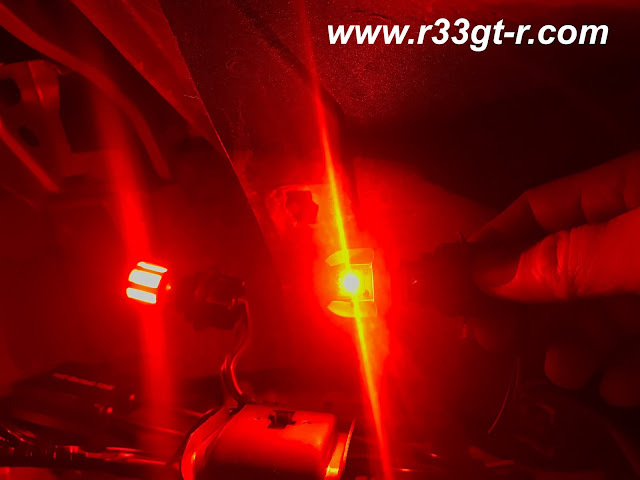 My thinking was, while there might be other LED bulbs that claim to be even brighter, I would be happy if these worked out by being just as bright as the Phillips, so long as the dark spots were gone. 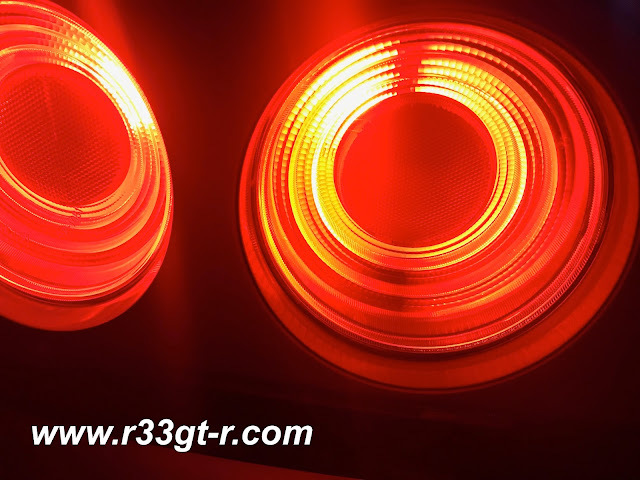 A few days later, they sent me a pair of these LEDs in a nice flat box with some other goodies (free black rubber work gloves... I'll post a photo later) and so I went out and immediately fitted them. Philips bulb on the right... and does it look slightly more orange? And further, maybe you can tell the color is different? 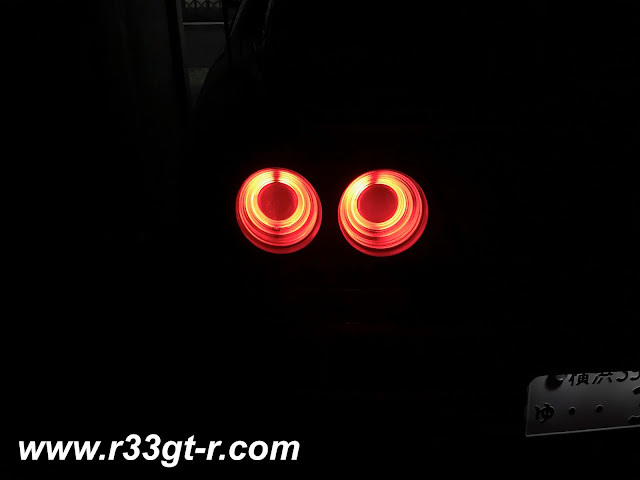 Anyway, based on this result, I went ahead and ordered another pair of these red LEDs from Pika-Q, to complete the other side. But, I took advantage of this timing and ordered a couple of extra items, which I will feature in my next post. Also used some LED shops there in Japan that aren't Philips or Osram etc. So you gonna use pika chu now? LOL. Nice name. 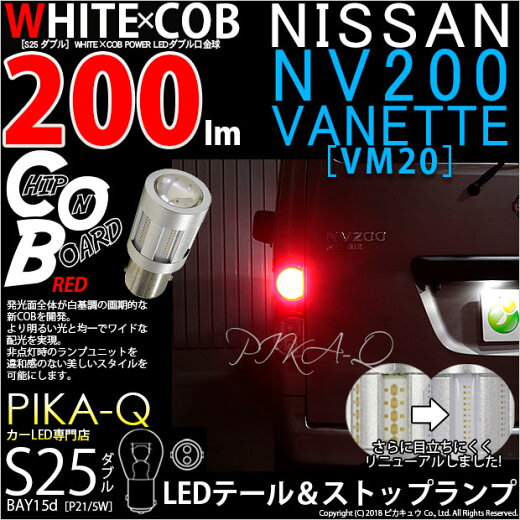 Need to see the difference between the OEM bulbs to the Pika-Q White COB, if you have the time for it. 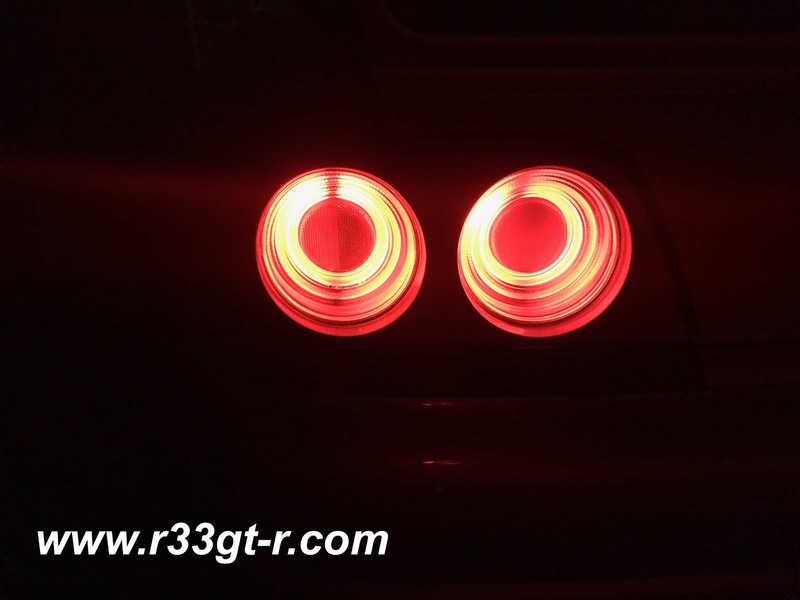 Mot - I did - please see my next post! Thanks for your inspiration. 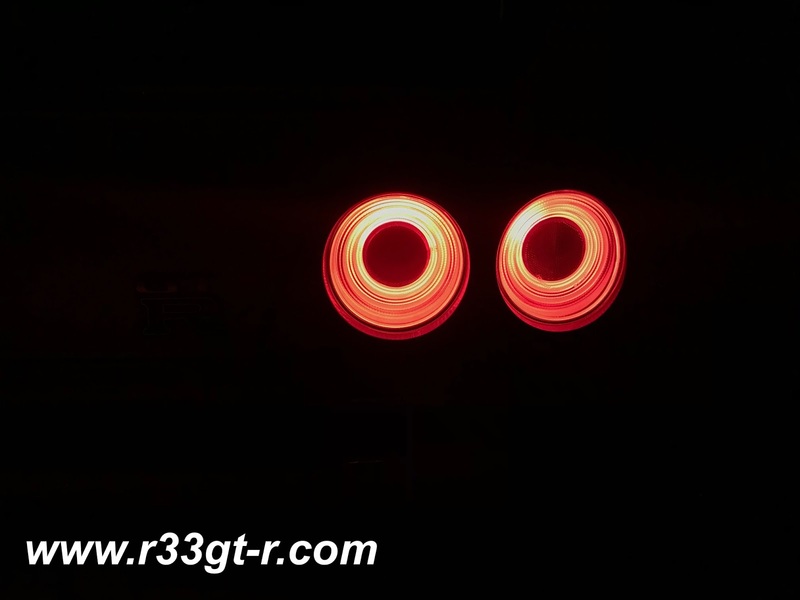 I bought some cheap Leds on Aliexpress and the result is really good. Possibly a small difference to yours, but only visible in direct comparison, imho. I also bought the electronic relay and it works perfect, no delay and works with bulbs and led in a mix.